Mia’s Men the first in the Heiress’s Harem by Lucy Felthouse is a modern spin on the reverse harem style. Mia’s father has just passed and she is having a difficult time dealing with not only his passing but the stipulations that six months previous he had put into his will. Her father decided that she needed to marry someone of her social standing within 12 months to inherit her father’s fortune and his estate. Mia isn’t happy about the new will but doesn’t want it to go to her cousin that would squander everything. So Mia sets out to find the right kind of husband, though is slightly side tracked by the gardener at her family estate. Tom is attractive and sweet and a shoulder for Mia to cry on, but he doesn’t meet her father’s requirements. In honor of her father, Mia attends a charity auction to raise money to help those with cancer. At the gala she meets best friends, Elias and Alex, that both show an interest in her. The two aren’t opposed to sharing her. While at the auction, Mia finds out that an item on her bucket list is available and Elias decided that he should win it for her. Though Mia feels unsure about taking it, she relents to Elias and agrees to go on a trip of her dreams. Though she has feelings for Tom, she starts to get feelings for Alex and Elias and even has a flash of feelings for a fourth guy that she meets while on her weekend trip. How will meeting four different guys affect her requirements to get married in years time? This was a good read. I liked how it was written from MIa’s point of view since so many things are happening to Mia that aren’t exactly the easiest thing to live with. Finding out the reasons for her fathers stipulations are interesting and how she reacts to them seem very natural. I liked Elias and Alex and they played well off of each other in their relationship. I like how they play off of each other and how they work together. The writing is done well and Mia seems to have the chance to grow from chapter to chapter even with the issues that she is faced with. 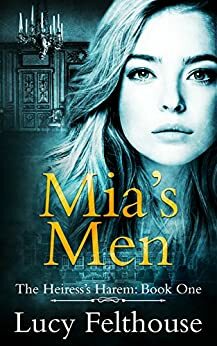 Check out Mia’s Men here.